Equitrekking, the high definition Public Television travel series that explores the world on horseback, has been honored with a Daytime Emmy Award for Outstanding Single Camera Photography. 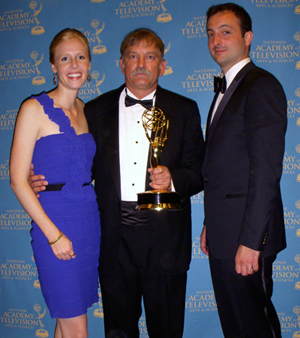 Darley Newman, Equitrekking’s host and producer, Chip Ward, Executive Producer, and Gregory Barna, Director of Photography, were honored with the Emmy at the Creative Arts Emmy Awards Black Tie Ceremony in Los Angeles, California. Equitrekking was also honored with a nomination for a Daytime Emmy for Outstanding Special Class Series. Other series nominated for Outstanding Special Class Series included longtime series on MTV's "True Life" and "Made." Alex Trebek, one of the hosts for the event, gathered with other celebrities including Susan Flannery, star of “The Bold and the Beautiful,” celebrity chef Ming Tsai, Nancy Cartwright of “The Simpsons,” talk show host Wendy Williams, members the cast of “Sesame Street” and television industry veterans to present the Daytime Emmy awards. Shot in high definition with travel expert Darley Newman, the Equitrekking series travels off the beaten path, riding horses with local people to get an in-depth, eco-friendly look at a destination’s natural surroundings and history. Equitrekking is broadcast on international networks, in addition to its broadcasts on PBS stations and the Create Channel in North America. Husband and wife team and young entrepreneurs Darley and Chip have built the series from the ground up, using their complementary skill sets and passions to creatively promote and produce each episode through online video and the Equitrekking.com website. The crew travels to Jordan and Turkey next, where they’ll film at Petra, the Dead Sea, Jordan’s deserts, Cappadocia’s ancient villages and beyond. The crew recently filmed its 28th episode in Alberta and Uruguay. “I’m elated. This is a great honor, and I couldn’t be more proud of my team. We’ve got the smallest, hardest working group in the industry, and I’m happy be here with them in celebration,” said Chip. View equestrian vacations featured on EquitrekkingTravel.com and learn how to book a trip.